Los Angeles Evening Express: Capture Of Vasquez, A Question Of Honor, 5-19-1874. Capture Of Vasquez, A Question Of Honor. A QUESTION OF HONOR.—We see that the Ventura Signal and some other papers that copied the account of the capture of Vas­quez from the Extra EXPRESS, is­sued immediately on the receipt of the news here, give us the proper credit. On the other hand, some news agent here had the hardiesse to send the full contents of our extra, verbatim, to the up-country papers, without the slightest recognition. We issued the extra and distributed it gratis, for the mere honor of the thing; but the distant imitator of Vasquez who furnishes news to the San Francisco Bulletin, etc., had no hesitancy in purloining the fruit of our enterprise, and boldly appro­priating it as matter originally gathered by himself. We doubt whether even Vasquez ever de­scended to so unblushing an act of spoliation. Had he not possessed more than ordinary executive ability, and more of the qualities of a leader than are usually found in his class, he never could have maintained himself so long, or have secured the allegiance and fidelity of his fol­lowers under the standing tempta­tion of a reward of $8,000 for his sur­render alive, or $6000 for his deliv­ery dead. The above, from the Sacramento Record, will not bear the test of criticism. Hardly had the ink dried on the Governor's proclamation, before he was figuratively de­livered, bound hand and foot, into the hands of the authorities. Vas­quez has shown cunning, but no great decree of ability as a leader. He eluded the officers successfully for a long time on account of the extraordinary character of the coun­try in which he lay concealed, and good luck attended him as long as he confined himself strictly to that country as the base of his opera­tions. But just as soon as it be­came a matter of finesse and strate­gy between the authorities and Vasquez, the latter, to use his own words to Under Sheriff Johnston, on his capture, proved to be "a — fool." Said he "I have been a — fool, and you've caught me because I was one." No money was found on him when he was searched. His cap­ture is probably due to the means placed at the disposal of the Sheriff by the Supervisors of Los Angeles two weeks ago, when they voted $4,000 to be used for his apprehen­sion. Vasquez was undoubtedly, betrayed by some members of his own gang, or by parties in the house where he was captured. He says he thought himself entirely safe, and was completely surprised. 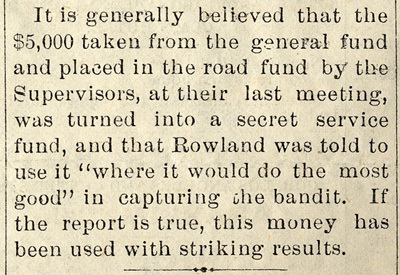 It is generally believed that the $5,000 taken from the general fund and placed in the road fund by the Supervisors, at their last meeting, was turned into a secret service fund, and that Rowland was told to use it "where it would do the most good" in capturing the bandit. If the report is true, this money has been used with striking results.